John Malkovich's Treehouse | Celebrity TreehousesTreehouse by Design - So, you thinking about building a tree house? Did you know that John Malkovich had a treehouse? Here’s the scoop: The year was 1993. The place, near Malkovich’s Provence, France house. A group of local residents was lobbying for a treehouse in a nearby park. Malkovich contributed money to the project. For those of you familiar with government reactions to treehouses, it will be no surprise that the group was unable to get a permit. The project never happened. But that’s not the end of the story. Malkovich contacted the treehouse designer, artist Clare Wilks, and asked her to build a treehouse on his property for his children, Loewy and Amandine. They were 3 and 5 years old respectively in 1995, the year the treehouse was built. According to Paula Henderson & Adam Mornement in their book, Treehouses, Malkovich gave a lot of input to the final design. 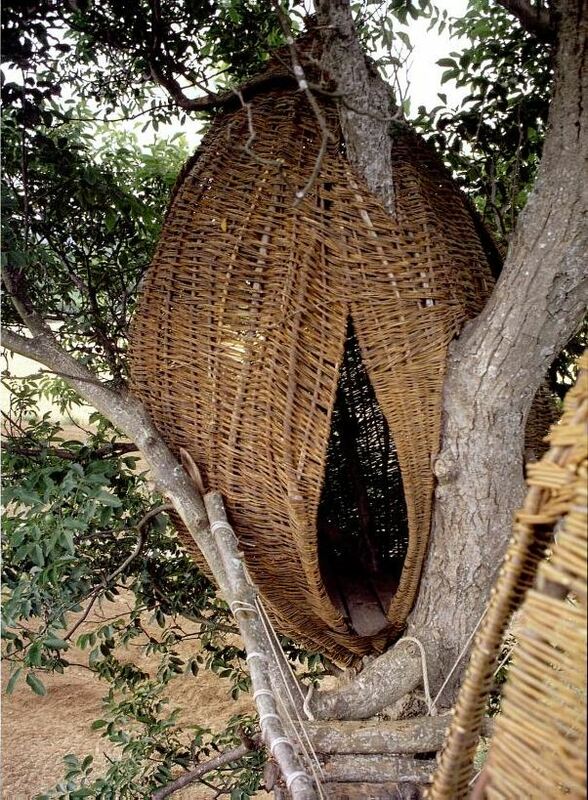 It featured a womb-like woven treehouse and adjacent canopy raised above an elevated log walkway. Malkovich wanted the material to be renewable and locally harvested, hence the willow weave, which has a very short lifespan. The John Malkovich treehouse is no longer in prime condition – the willow no longer weaves through the structures but the framework still exists. Who knows? Maybe one day Mr. Malkovich will resurrect it – perhaps for his grandchildren.